Bible tools for personal study or attending a Bible study … which shall it be? Both are important, but let’s answer a question with a question: Is it better to give a hungry person a fish or teach them how to fish? On this website you’ll find free access to four basic Bible tools: 1-King James Bible, 2-Interlinear Bible, 3-Strong’s Concordance, 4-Hebrew/Greek Concordance. These Bible tools will help you Dig for Bible Meaning. You now have your answer to the above question. Personal Bible study to Unlock Bible Meaning … a method for deepening your understanding of Bible Meaning is the way to growth. Sure, if someone gives you a ‘Bible answer’ it’s helpful, but going fishing and pulling in that Bible answer is more rewarding and helpful. In the end, or I should probably say, the beginning, you need to learn how to fish for yourself. Yes, you need guidance … but not to point you to Bible verses … you need guidance to learn how to find those Bible verses for yourself. One of the keys to deeper Bible Meaning is learning how to use Bible tools. It involves rolling up your sleeves and learning how to do it. In France, where I live, there’s a campaign called ‘mangerbouger‘ which I could translate by ‘eatmove‘, the idea being to ‘eat right’ and ‘get some exercise’. Well, we could apply that exact same slogan to our spiritual study lives: Proper Bible diet and proper Bible gymnastics with proper Bible tools. Strong’s Concordance is a multi-function Bible tool that fundamentally helps find various translations of the same Hebrew word and locate those words elsewhere in the Bible. Along with other functions it will help us Dig for Bible Meaning. An ‘Englishman’s Concordance’ that I’m calling the “Hebrew/Greek Concordance’. 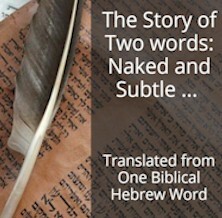 It will help you locate all instances of the identical Hebrew/Greek word throughout the Bible. Hence, you can easily group and read all the contexts where this same word is used–and see how the KJV translators rendered it. These Bible tools help you find all instances of the original Biblical Hebrew word along with its translation in the English King James Version. This is known as the Englishman’s Concordance which I’m call the Hebrew Concordance. Hence the need for basic Bible tools: the Interlinear Bible and Strong’s Concordance. This is not to learn Hebrew, although you are going to learn some points you are not aware of. This is not to memorize vocabulary or speak the language. Using these tools will help you better understand the meaning of the words of the Bible and therefore the plan of its a/Author. My intention is to help you learn how to fish. You need to go fishing for yourself, but you need a method so you can catch edible, healthy, nourishing fish. I don’t want you dieting on misunderstood and twisted vocabulary. That isn’t positive for your mental and spiritual health. It’s like mushrooms, they all look good on the outside but you absolutely need knowledge and insight before you decide which ones to eat. With mushrooms it is a matter of health and sickness and even life and death. Your spiritual health is that important, undoubtedly even more so. This teaching method is designed to help you think about points that you’ve never thought of before. As one wise man said, ‘That which I see not … teach thou me.’ Fortunately, or unfortunately there are many things and especially many questions we don’t see. The teaching method I’ll employ is designed to help you ‘learn how to learn’ … and at the same time freely give you all the tools you need to be able to do just that. Looking into the original Biblical Hebrew-with no fuss–is a proven method to dig for deeper Bible meaning and it will help you open new exciting doors to verify your Bible understanding.